Michele De Lucchi was born in 1951 in Ferrara and graduated in architecture in Florence. During the period of radical and experimental architecture he was a prominent figure in movements like Cavart, Alchymia and Memphis. De Lucchi has designed furniture for the most known Italian and European companies. For Olivetti he has been Director of Design from 1992 to 2002 and he developed experimental projects for Compaq Computers, Philips, Siemens and Vitra. He designed and restored buildings in Japan, Germany, Switzerland and in Italy for Enel, Olivetti, Piaggio, Poste Italiane, Telecom Italia. In 1999 he was appointed to renovate some of ENEL's (Italys principal Electricity Company) power plants. For Deutsche Bank, Deutsche Bundesbahn, Enel, Poste Italine, Telecom Italia, Hera, Intesa Sanpaolo and other Italian and foreign banks he has redesigned the service environments and corporate image, introducing technical and aesthetic innovation into organization of their working environments. He designed buildings for museums including the Triennale di Milano, Palazzo delle Esposizioni di Roma, Neues Museum Berlin and the le Gallerie d'Italia Piazza Scala in Milan. In the last years he developed many architectural projects for private and public client in Georgia, that include the Ministry of Internal Affairs and the bridge of Peace in Tbilisi, the Radison Hotel and Public Service Building in Batumi. His professional work has always gone side-by-side with a personal exploration of architecture, design, technology and crafts. 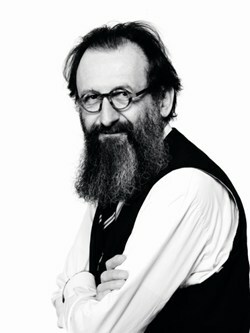 In 1990 he founded Produzione Privata, a small-scale production and retail company through which Michele De Lucchi designed products that are made using dedicated artisans and craft techniques. From 2004 he has been using a chain saw to sculpt small wooden houses which create the essentiality of his architectural style. In 2003 the Centre Georges Pompidou in Paris has acquired a considerable number of his works. Selections of his products are exhibited in the most important design Museums in Europe, United States and Japan.